By default, Explorer++ allows multiple instances of itself, that is, you may open more a one copy of Explorer++. Each new copy can have its own set of tabs and settings, etc., subject to information below. If this option is disabled (box unchecked), ie. do not allow multiple instances, then attempting to open a second copy of Explorer++ (eg. by double-clicking on a shortcut) will open a new tab instead. While multiple instances of Explorer++ are open, each copy maintains tab and settings information in its own memory space. However, on closing, each copy will write complete settings information to the Windows registry (or config.xml file). Closing the next copy will also do this, overwriting the settings from the first. This means that the last closed instance of Explorer++ ultimately determines the settings (and tab information) saved for the next session. This behavior is by design. If you have multiple copies of Explorer++ open, the one with your preferred tabs (and settings) should be closed last. If multiple instances are being used along with portable mode, you can make a backup copy of your config.xml file. Disabling this option causes the Tab bar to disappear (ie. not displayed) when only 1 tab is open. If 2 or more tabs are open, this setting has no effect. The Tab bar is normally displayed at the top of the Files pane; enabling this option (ie. checking the box) displays tabs at the bottom, just above the Status Bar (if enabled). With this option disabled, the Tab bar extends only the width of the Files pane. Enabling this option displays the Tab bar the full width of the window; more tabs can be displayed in this mode. These settings modify Explorer++’s title bar, which normally only displays the current folder, followed by “Explorer++”. A sample title bar follows, showing only the current folder (“AtomExplorer”). Note that these options may be enabled in any combination. The more options enabled, the longer the window title. Enabling this setting displays the full path to the current folder. The following image demonstrates this. Enabling this setting displays the current user’s name (actually the owner of the Explorer++ process), preceded by the domain name. The domain name refers to the location of the user’s account, which could be another computer on a network. In most cases, individual computers will just show “DESKTOP” signifying this is a local account/user. Users - fewer rights. This prevents accidental changes to the system. Normal selection of an item in details view just highlights the left-most column (usually Name). In order to select that item, the left-most column must be clicked; clicking on another column has no effect. However, when this option is enabled, the full row is highlighted; selection may be done on any column. Explorer++ can, if desired, introduce a 500 millisecond delay between selecting a folder in the Folders pane (ie. treeview control) and opening its contents in the Files pane. This delay is entirely cosmetic; it may prove useful for users who navigate the folder tree using the keyboard. With the delay, using the up/down arrow keys would not open the folders contents for each folder as the selection was moved up or down. 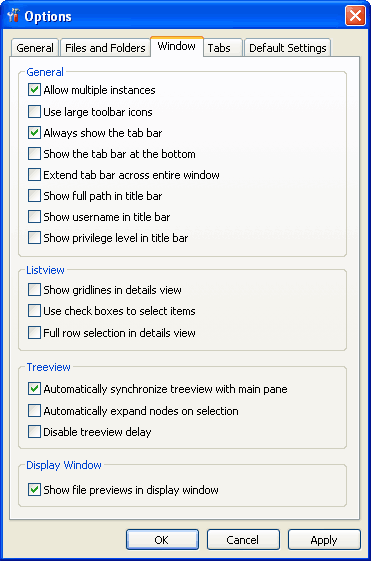 By default, this option is enabled, disabling the treeview delay; clearing the checkbox enables the delay.